One of the things I miss living in Beijing is shopping for arts and crafts supplies for my daughter. I miss the good old pound store where art and craft supplies are widely available and you can get ideas while you are shopping around. Yes, internet shopping is a solution but my Chinese is non-existent, and what would I look for? I have found arts and crafts boxes that can be delivered with sets of supplies inside, but it did not leave anything to the imagination and left me deciphering the Chinese instructions while my daughter just wanted to be creative and mess about. And frankly the box was too expensive just to be messing about. Luckily for us moms there is a solution in sight. Want to do arts and craft, but don’t want to spend a lot of money? Want to be able to access an array of craft articles? 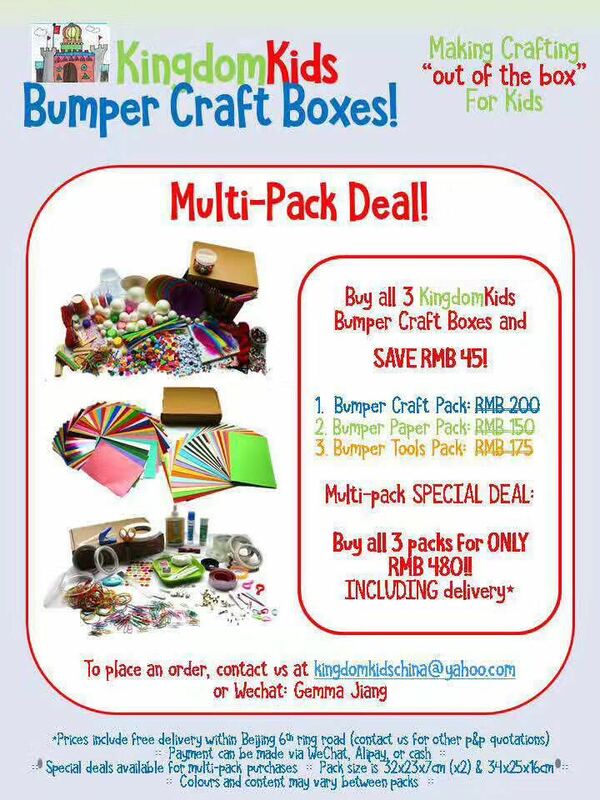 A talented mother has set up Kingdom Kids Bumper Craft Boxes: an arts and craft box service without instructions, just ingredients to get really creative and have fun with your kids. What could be easier than emailing or WeChatting, and receiving a box with craft supplies for kids. It saves mothers and fathers searching the internet and the shops to find creative bits and pieces we did not even know existed. Kingdom Kids will start selling from next month and will start with three kinds of boxes, Bumper Craft Box, Bumper Paper Box, and Bumper Tool Box. Prices vary from RMB 150 to RMB 200. And there are deals for multibuy options.